REPAINTED MY EASTPAK FROM 2012! BLACKBOOK SKETCH WITH A QUOTE. 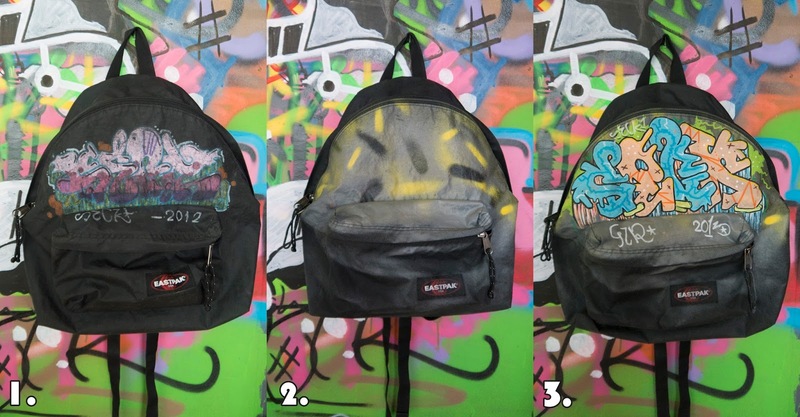 School is coming closer, wanted to paint my eastpak again for a long time already.. But I didn't have the time or cans. Today I did got some time and cans! From the 'HEMELS' piece there's some paint left, and 'ROPANA' is coming too.. Big plans yo! First off I painted it gray with Henxs paint.. After the paint was dry enough I painted some black and yellow lines over that with MTN 94's. Let it dry for half an hour or so, and started sketching the outlines. In about an hour or 2 it was done. I've used a simple version of the 'Baby Colours' sketch in my blackbook, remember that one? Enjoy!